It was in 2013 that Lifesigns, then comprising John Young on vocals/keyboards, Martin “Frosty” Beedle on drums, Nick Beggs on bass/vocals and producer Steve Rispin released their eponymous debut album (see review). In this reviewer's opinion, it was one of those rare things, a faultless album, brimming over with prog beauty - exquisite song writing, melody and artistry which resonated deeply, both lyrically and musically. Four years later and along comes that difficult second album, together with a slight change in personnel, Jon Poole (Cardiacs, Dowling-Poole Project) replacing Beggs and Dave Bainbridge (Strawbs, Iona, Celestial Fire) enlisted as resident guitarist. Fan power had a big part to play in this album finally taking off. Much is also owed to Cardington, a village in Bedfordshire close to Young's home, which fuelled his imagination and his great passion for flying machines, especially airships and barrage balloons, which are made there. That passion is again Young's touchstone for assembling seven new and very contrasting songs, which evoke a completely different feel and atmosphere compared to the first album. The emphasis again is very much on the sumptuous melody lines and depth of arrangement, so beautifully handled and initiated with loving care by the band members in each of them. That also follows in Young's choice of guest guitarists making their own distinct contributions, in this instance, Menno Gootjes (Focus), Niko Tsonev (Steven Wilson, Lifesigns live) and Robin Boult (Fish, Howard Jones). But there are little echoes of album one throughout, starting with N, a wonderfully crafted song full of lovely twists and turns, which lays down a very high musical bar for what is to come. Young's warm voice is very much to the fore, singing the lines “I tried to tell you but no-one listened” harking back to Telephone on Lifesigns, while elsewhere, the keyboards echo the Beatles and Yes, two of his biggest musical influences. Bainbridge's scintillating guitar also comes into its own at the denouement of this track, while Beedle's brilliance drives it along rhythmically. Voice In My Head, co-written with Beedle, has become a live favourite of the band and it takes on a dream-like quality in the studio. Again, a ringing telephone is another echo of past glories and Gootjes' lovely guitar also enhances the quality of the song. Being an individualist and his own man has always been central to Young's psyche and Different, another of the popular live songs, further amplifies this view. The studio version again touches on some of Young's other classically trained talents, one passage being almost hymn-like, another being akin to a classical work-out while, among his myriad keyboard effects, one sounds just like a guitar solo. Different? You bet! Another live crowd-pleaser Impossible has another of those impossibly catchy hook lines. Gootjes, Tsonev and Bainbridge all get a chance to shine individually within the composition and all make a very complex track seem impossibly effortless. Young has always been outspoken about how the music industry has been quick to exploit performers without given anything back and Touch is the result, co-written with Beedle and Rispin. A great keyboard marimba effect is one of its stand-out moments while Poole's rumbling bass provides a suitably enraged undercurrent to leave no doubt what the band thinks of the current tricks of the musical trade. Finally, the title track Cardington is a lovingly crafted paean to those magnificent flying machines of the past. It's a song which flies in its own right, Young's vocals lifting higher and higher, Boult's luscious soulful guitar solo driving it further forward. Floating, disconnected voices and duelling guitars also feature, and it all ends with that distinctive “putt putt” sound of the mighty airship coming back down to earth. 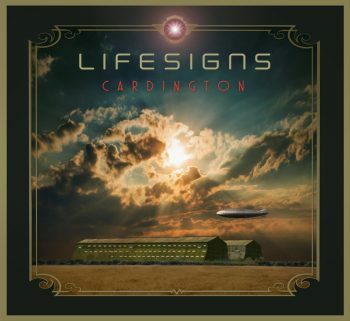 I did have initial reservations on my first few listens of Cardington, wondering if it would finally take off. Young is one of the most intelligent and instinctive of composers, arrangers and musicians and this album is of such a clever construct that it continues to both open up and deepen on subsequent hearings. The fact it has been on my car CD player uninterrupted for the past week should give a clue as to how highly I now rate it.